So how many of you name your fish? What are some good names? I had 2 Ocellaris clowns (30g, FOWLR, lots of bristleworms), and one night my girlfriend convinced me to name them. So I named them after this terrible fish song, Brian and Robert. Robert(a) was the girl, since she was the bigger of the two in the pair. Anyway, Brian died THE NEXT DAY and I am convinced it was because we named them (or, because I was in Europe for 4 weeks and didn't change the water in maybe 2 months). Anyway, after a while monitoring my tank and thinking it was stable, I got another clown to be a friend for Robert and also got a Royal Gramma Basslet. My girlfriend named the clown Tipsy (which was great because of how he swam) and the basslet was named Scuba. Classic names. Unfortunately, both died within a few weeks. So after about 6 months and lots of water changes (nitrates were high), I've gotten another clown. He's been around for at least a month now, so I have good hope for him to survive. His name is Dingy. What about some other fish names?? I admit I name most of my fish that I can identify individually. I have a Dragon Goby named Giger. Peppered corydora's named Queen Mab, Rodger, Rodregues and Bob. White clouds named Mamma (the most prolific breeder) Tiny, tim and trouble (the only ones I can identify out of about 80). I name my fish, sometimes based on their names, my gold nugget pleco is simply Goldie. But others I name on their personalities. My one cichlid is the biggest digger in the tank, so hence his name is Digger. My biggest cichlid is Louie, no reason I can tell other than I came up with it and it stuck. LOL. White koi, Whitey, orange koi with a bump on his dorsal, Donkey. My BN pleco is Ben. The rule is, if its living in my house it has a name. The goldfish is Depot because she was black, orange, and white (the home depot colours and Tony Stewart colours). My bettas are C.C. (Clarence Carter-good singer) and Angel (she's white and it was the opposite of her personality). The snail is Mr. Clean because he's going to clean some tank floors. I also name all of my hissing roaches. They have religious names and death names, since roaches remind my roomie of death. I have Requiem, Mortis, Epitaph, Parish, Lament and the babies need names yet. I once named two cactus plants I had. Spike and Leo. They are living so they had names. The fish I have that are larger and have distinct personalities usually wind up getting a name. My schooling fish usually do not, though they sometimes get a collective name. I like sticking with movie character names. Sometimes this goes into hitorical or current known names. For example, my two favorite wold be Merlin and Donnie Darko. My boyfriend likes to use puns. I had a set of clowns that I called Bob and Mel (Simpson's reference... Side show Bob, and Side show Mel, both clowns). I then stuck with the theme when Mel passed on and I got a B&W clown and called him Bart (aka Black bart). My dad named my urchin Spike (real original ) and he is my oldest living tank member! My goby has yet to be named, we weren't sure if he was going to make it (he's straight from the DE bay). 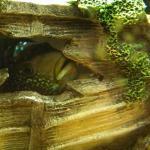 My 2 green spotted puffers were Flotsam and Getsam.